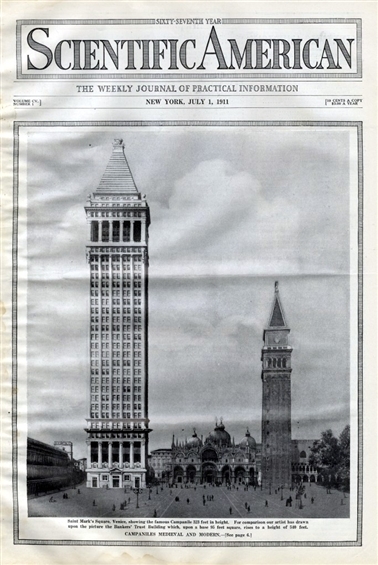 The cover of the Scientific American of July 1, 1911, which pictures a drawing of the Bankers Trust, then under construction, compared with the Venetian bell tower of San Marco, raises the issues of style and scale. The historical masonry monuments of Europe could only achieve around 100 meters, or 330 feet with stone construction methods. By 1910, New York skyscrapers were doubling that height, but more importantly, enlarging the overall scale and usable interior spaces for commercial buildings. Most American high-rises of the first decade of the twentieth century relied on historical reference and ornament to communicate their status as "Architecture." There was little discussion of "modern" as a style of its own during these years, except in some circles in Chicago and in the person of Frank Lloyd Wright. But there was much discussion among architects and critics of the most appropriate stylistic "fit" for the verticality of the skyscraper. The two basic choices were classical or gothic. The first had the problem of an emphasis on horizontal lines of colonnades and cornices that divided the facades into multiple sections, as in the Park Row or Flatiron buildings. Historical examples of tall buildings in the classical style were mostly campaniles. Gothic buildings, though, whether cathedrals or civic structures, pointed skyward with their slender spires and their upwardly-aspiring ornament in a way that seemed well-suited to the increasing heights of New York's skyscrapers. The further emphasis on tower tops and the animated roofline silhouettes of the gothic-styled Liberty Tower and West Street Buildings can be seen in the photographs on the right.